Model: XNiteQX7 UV + Visible + Infrared Electronic Microscope. 10x, 60x & 200x Zoom. We have taken the terrific Digital Blue USB QX7 electronic microscope and converted it to see ultraviolet, visible and infrared light. We also have added a 25.5mm filter ring to the lens so that you can attach filters to the microscope which are available here. By attaching different filters to the microscope, you can restrict the camera to see a particular wavelength range of interest. Magnification can be selected to 10x, 60x or 200x by rotating the lens wheel on the front of the camera. The microscope includes top and bottom mounted white LED's to provide sample illumination. If you need infrared or ultraviolet illumination, you will need to provide the light source. We can modify the LED's in the camera for a fee to variety of fixed wavelengthes in the UV, Visible and Infrared ranges. The QX7 connects to a Mac or PC via the supplied USB cable. The QX7 comes with PC software. The software can take pictures, movies, change camera exposure, enable time lapse mode and turn On/Off the illuminating LED's. Picture resolution is 640 x 480, 3rd Party Mac software QXScope and miXscope are available for a fee from their respective developers. The head of the QX7 can be easily separated from the base if needed. By using a 25.5mm CC1 IR and UV blocking filter, the camera will take normal pictures. We have many other 25.5mm filters in the UV and infrared ranges to restrict the camera to other wavelengths. You can purchase the filters Here and can see the filter transmission curves Here. The QX7 requires a high powered USB port. Some computers may not provide enough power to run the QX7 through the USB port. If this is the case, you should purchase a powered USB hub which costs relatively little at places like Amazon. 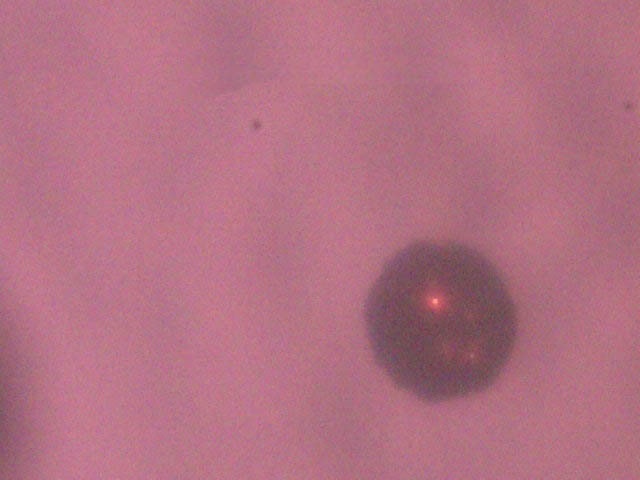 Example image taken with an 830nm filter at 200x zoom to examine an air bubble inside a piece of Schott filter glass. The QX7 Microscope is the upgraded version of the award-winning Intel QX5 computer USB microscope. Explore the microscopic world with the only USB microscope that connects to a computer. The QX7 USB Microscope includes software that allows you to view, edit, animate and even measure samples, then create slideshows and videos. The QX7 USB Microscope has the mobility to come out of its base for the viewing of larger or possibly live samples in their natural habitats. Now works on Windows Vista and Microsoft Windows XP, 2000, 98, 98SE, ME. Digital Blue QX7 USB Microscope. Get children and adults to play the smart way with the QX7 USB Computer Microscope. The QX7 microscope magnifies anything from 10x all the way to 200x. You can view everything from the pre-prepared slide of a honeybee leg to a close up of your own tongue. The QX7 is not only a microscope though, it also serves as a multi-function digital camera for taking digital still images and creating time-lapse movies. The QX7 USB Microscope also includes photo manipulation software that allows them to create and experiment with special effects and audio effects, which can all be inserted into the same images taken with the QX7. The QX7 USB Digital microscope is a great item for any child or adult with an imagination, and will keep them happy for a long time to come! 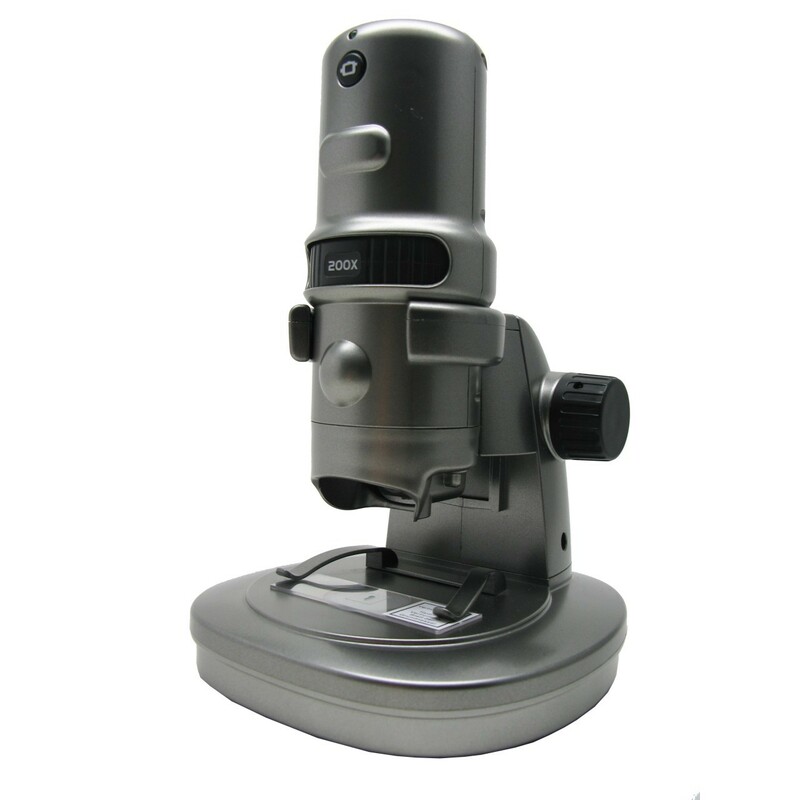 Overall design features of the microscope are stylish and simple, yet they take advantage of state-of-the-art video imaging and computer technology allowing amateur scientists to explore their environment with optical microscopy at magnifications up to 200x. Electrical power for the camera system and specimen illumination lamps is obtained from the computer through the Universal Serial Bus (USB) port. Information and control commands are also passed between the computer and the microscope using this pathway. The accompanying software package provides an interface that is very nicely done with excellent graphics and audio clips that are presented through a kid-friendly layout. Students are able to capture single images, make movies, and perform time-lapse investigations on a variety of specimens with a single click of the mouse. The most impressive thing about this microscope is the fact you can take it out of its slide-viewing cradle. As long as it's still plugged into the computer, you can magnify anything with it: the hairs on your arm, your eyeball, flowers, or even the hidden microscopic text on money. While it is harder to focus using the microscope in handheld mode, it allows children to interact with a moving and alive world, rather than the pre-prepared, dead, flat world of the traditional microscope. Another killer feature of the microscope is that it's not just a stills camera, it's a movie camera too. Carpet fly-overs, centipede's leg articulation or flies digesting their food can all be captured. You can even create a time-lapse movie. Photographing a sprouting seed over hours and then playing the images back as a movie is an amazing leap forward from the static view of a traditional microscope. With the CD-ROM software included with Digital Blue QX7 USB Microscope you can capture images and manipulate them with simplified, but still very useful paint tools and special effects (including fly-eye, kaleidoscope and atomic glow). If this pretty versatile array of image manipulating tools isn't enough you can even import or export your captured images to other programs. Kids can share their creations by printing their projects as posters or stickers or by e-mailing images to friends. Children can also create their own slide presentations by sequencing and editing the captured images, video clips and time-lapse movies and adding music and sound effects. The unit itself appears robust, is brightly colored and very simple to use...even parents will understand how it works. Time has been taken over the computer interface too. All captured images and movies are stored in one easily accessed collection window. Image manipulation is straightforward and very "undoable" if you make a mistake. Most kids should be able to enjoy the product as soon as it's installed and features like spoken word help will guide them through the more complicated functions. Microsoft Windows Vista, XP, 2000, 98, 98SE, and Windows ME. Intel Pentium, Celeron 200MHz or processor that is comparable or faster. Special effects are enhanced for the Intel? Pentium? 4 processor. If you already own a microscope and are looking for a camera that fits in the microscope eye tube, please go here.